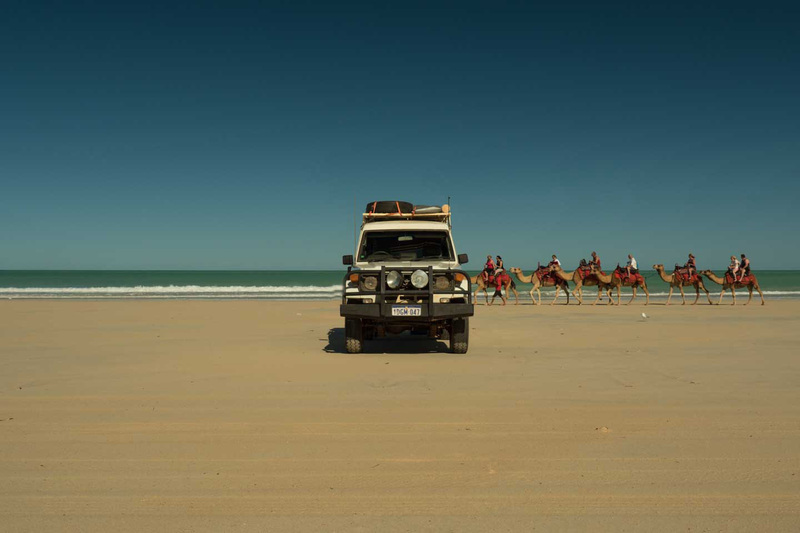 Along our trip in the Northern Territory and Western Australia people always told us: Wait until you get to Broome…..! 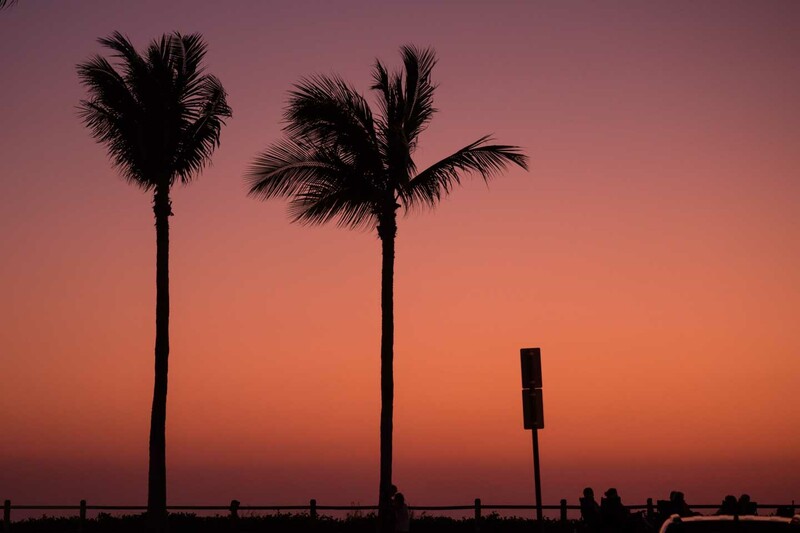 We heard about its beauty, about camel rides, beach life and the staircase to the moon. 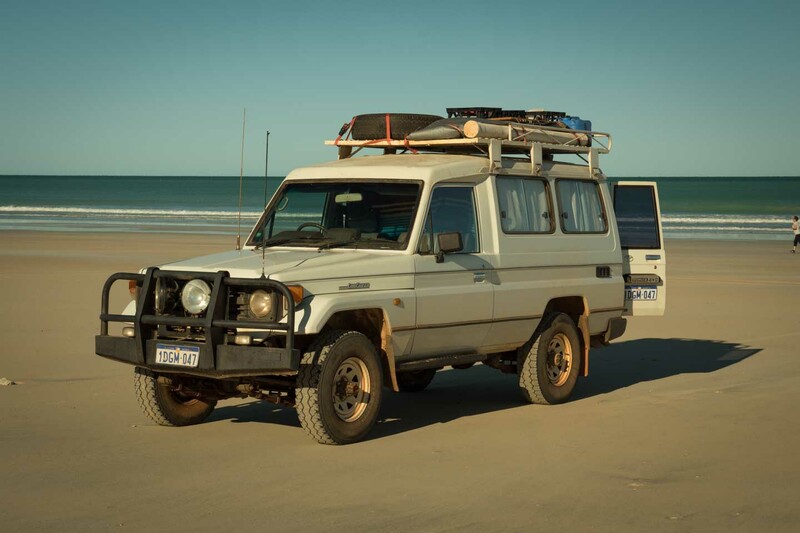 Depending on where you come from, Broome is either the first or last place where the highway hits the Indian Ocean. It's a town where modern life meets aboriginal culture. A face-off that bore a few surprises we did not expect. Our first impression of Broome was different from what we thought it would be. Driving into town from the north, the first thing we saw was the airport that is located only a stone's throw away from the major mall. That was not what we were being told and looking for. We than went down to Cable Beach which was more of what we expected. The beach is nice and has a beautiful boardwalk that becomes really busy during sunset. Even though we got used to living in our beloved Landcruiser we checked into the local YHA hostel. Months ago in Darwin we bought a 10 nights bundle deal and still had 4 nights left. What we did not right understood at the point when we bought the package was that we could only use 3 nights in one hostel and the whole deal was only valid for 3 months. We had used the maximum stay of 3 nights in Darwin and in Kununurra but now time was running out. After so many nights in our own car and bed we did not feel like moving back in a shared room but we managed to cash the last 4 nights at once at its last day of validity. 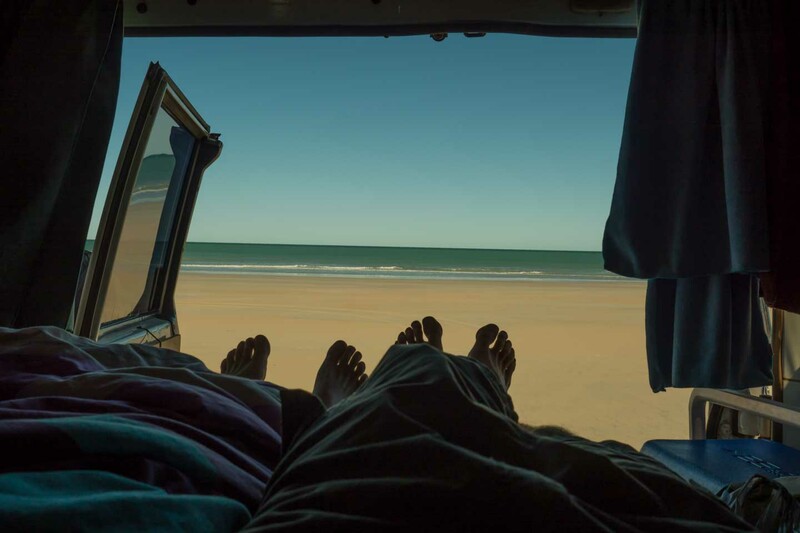 One thing we really noticed in Broome was that we could not get along with hostels any longer. I don't know if we are just to old, spent to much time alone or if it was just this particular place. To us it seemed everyone was trapped in a daily routine of sleeping long, eating slow and drinking fast accompanied by a lot of noise and dirt. So much the better, there was something else drawing our attention. On our way to Broome several people had told us about the staricase to the moon. It is a natural phenomenon that occurs between march and october on Roebuck Bay. During three following days the full moon rises over the mudflats created by an extreme low tide and the reflections lead to the illusion of a stairway to the moon. We had timed our visit to Broome according to the moon and went to see the spectacle the three following nights. It took a few attempts but we finally managed to make a time laps movie of the event. Feel free to share our Youtube version. We are anxious to keep our website free from advertisements but the commercial spots on our Youtube Channel help to support us. 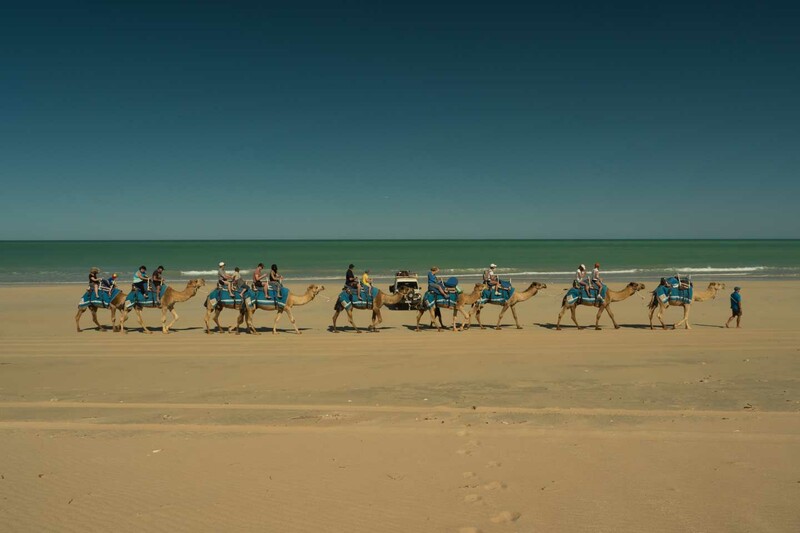 Cable Beach is definitely one of Broome's main attractions. It's a lovely surf beach and you are allowed to drive your car on the northern part. Beside that, various companies offer camel rides during sunrise and sunset. Every tourist brochure and even the Lonley Planet will tell you that this is something you can't miss out on. They show lovely pictures with great atmosphere and make it look like a desirable thing to do. 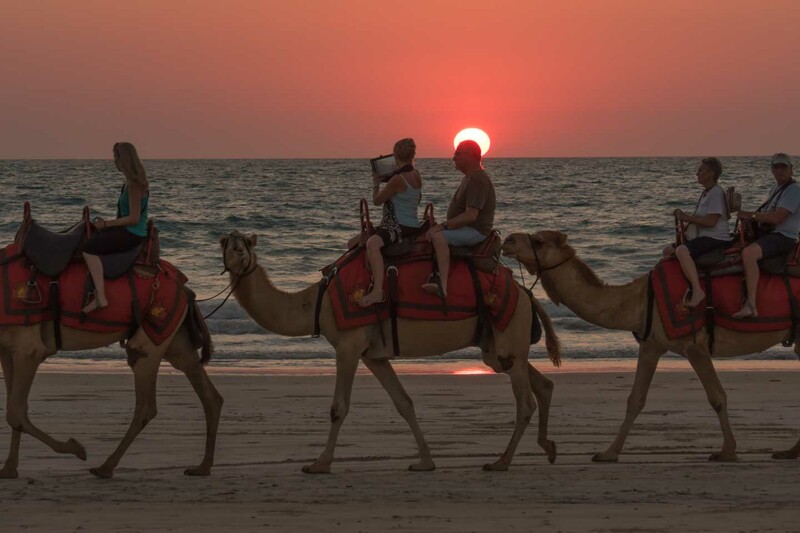 In reality the camel tours look a lot different from what the advertisements show. The whole tour takes about an hour. One client after the other has to mount a camel and the whole procedure takes at least 15 minutes until everyone is ready to go. With the utmost probability you will not be the only caravan. When we went down to the beach to watch the spectacle there were at least 4 groups following each other closely. They went really slow a few hundred meters up the beach, turned around and went back. At the same time the tours have to compete with a large number of private cars that come down for the same reason. Further you have to keep in mind that it will take another 15 minutes until everyone gets off the camel. That leaves you with about 30 minutes riding with a speed slower than walking. The camel tour will set you back somewhere in between $60 and $90 depending on the time of the day. Despite feeling sad for the camels we think this is absolutely not worth it. There are a lot of better ways to spend your money and trust me: Pictures come out a lot nicer when you are not shooting from a shacking camels back. We had been in contact with Australians indigenous art and traditions on quiet a few occasions. Thanks to the government of the Northern Territory and Western Australia there are a lot of information boards around the national parks. We had visited aboriginal land, seen ancient rock art and wall drawings. 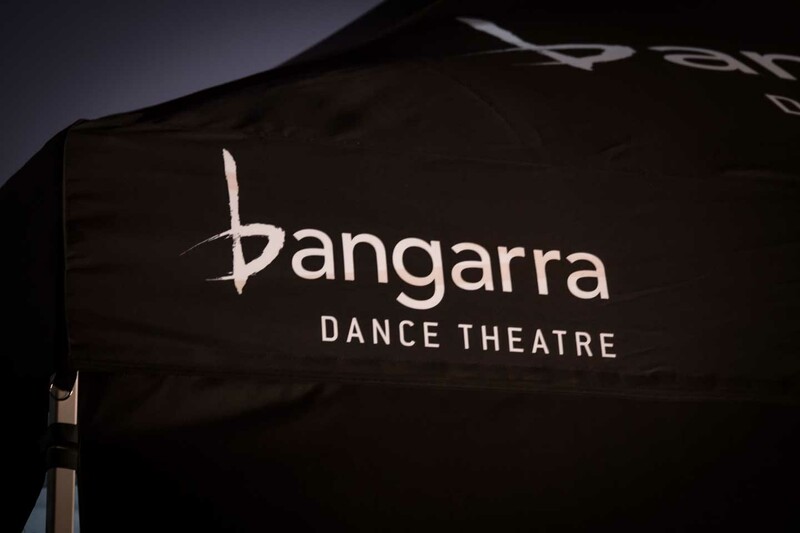 When we heard that the famous Bangarra Dance Theatre would make an appearance in Broome we were really looking forward to see them perform live. 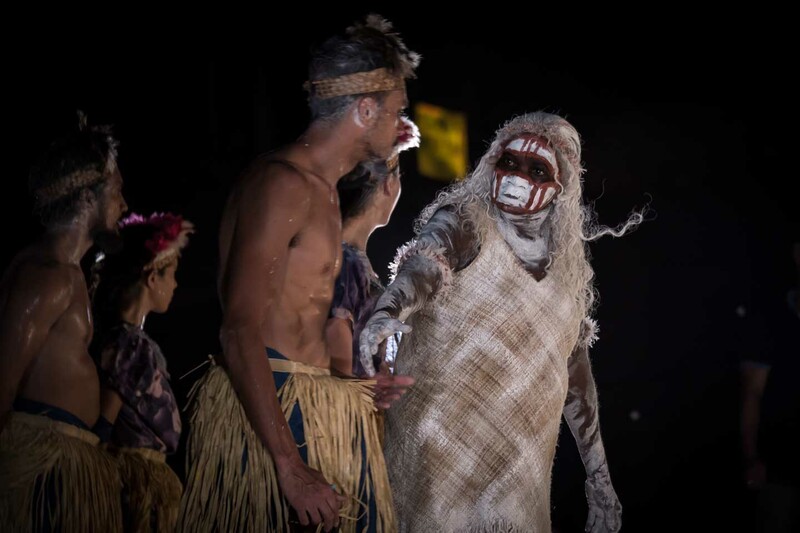 The performance given by the Bangarra Dance Theatre was part of a tour through the Northern Territory and Western Australia. 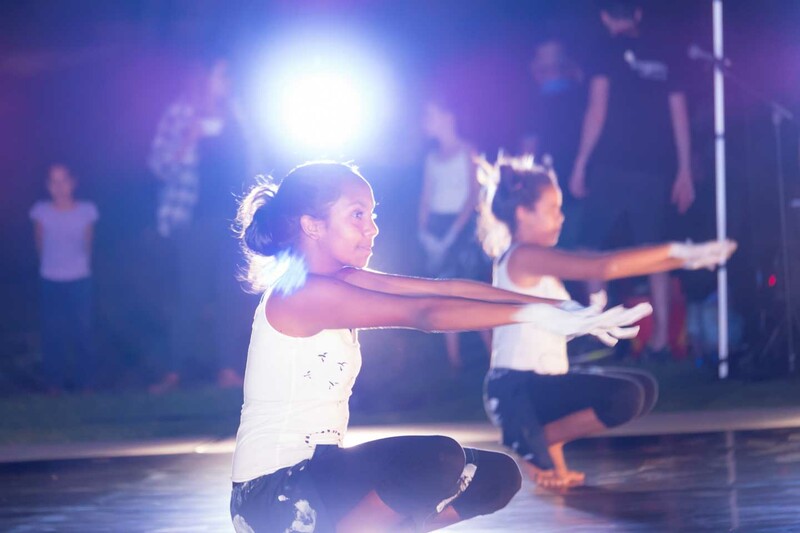 Beside the short highlight show the dancers went out to aboriginal communities to perform dance workshops. The Broome event started off with a dance performance by a local teenager group. The art of dancing and movements were quiet different from what we knew and bore some sort of spirituality. From the first second the show drew everyones attention. 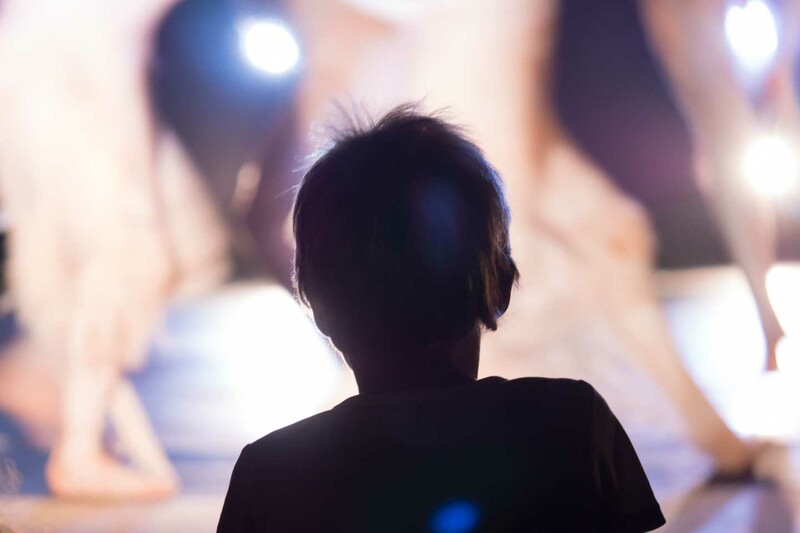 Young and old were likewise fascinated by the modern and abstract interpretation of centuries old tribal dances. The teenagers were followed by professional dancers performing short sections from the usual longer event. We shared the experience with a few friends we had met on the road before and were all impressed. It is hard to understand what the aboriginal culture is all about. Ancient legends are telling stories from people that went to a certain area and turned into birds, giant snakes that became rivers and mountains that bear the soul of former relatives. Everything has some sort of origin and mystery to give away. What really brought me closer to the understanding of aborigines was seeing the land they lived in for thousands of years with my own eyes. Walking the same pathes, drinking water from the same springs gave me an idea of what it must have been like to live here. On our trip we were told stories about how aborigines are claiming their land back. Ancient knowledge has been passed down for generations and today turns into proof of former settlements. 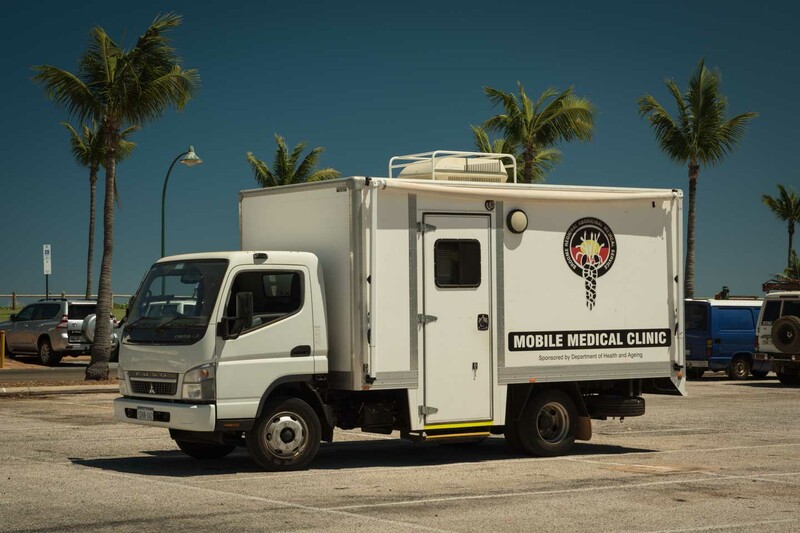 Local authorities accompany indigenous people into the outback. They drive and walk for days far off any road or civilization until they stop at a precise point to dig for water. No one has been here for maybe a hundred years but the knowledge on how to travel the land, going from fountain to fountain has been passed on. Beyond belief but true most fountains can still be found at the exact point the legends tell and serve as a proof for territorial claims. Since the Aboriginal Land Rights Act in 1976 more than 50% of the Northern Territory has been returned to aborigines who make up about 30% of todays population. Back in Kununurra we witnessed a few fistfights between indigenous people and during our stay one aborigine was shot in a liquor store. 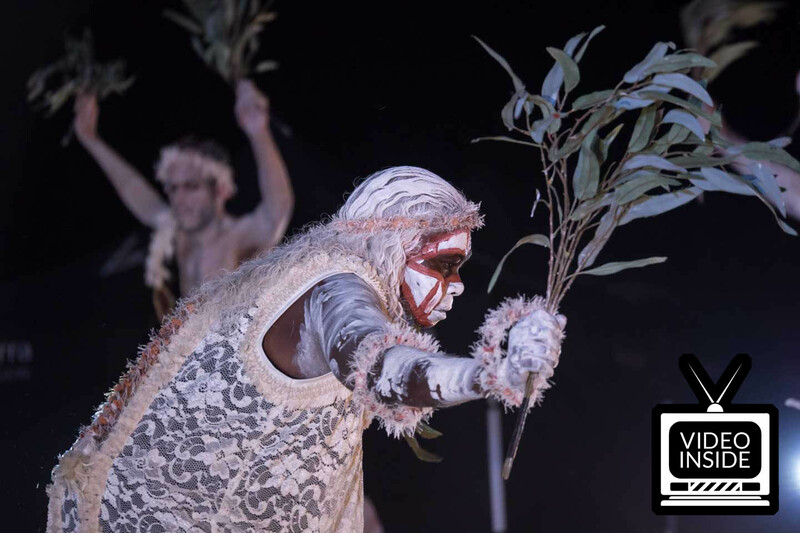 In Broome we came across a strange outgrowth from the omnipresent clash of indigenous culture and modern society. The public library had to seal all power points to avoid fights within the building. Further all local liquor stores were not allowed to sell cheap wine or make special offers like they do anywhere else. Then again friends of us spent a week in a remote aboriginal community and came back with great stories and a better understanding of the conflict. I will not lower myself to take sides in favor or against one or another but from what we witnessed this conflict is nothing that will settle easy. As different as the protagonists are, I can understand both sides and sad but true it seems there will always be some sort of reaming between the two parties. We have seen that the government is putting some real effort into trying to integrate aboriginal people into todays society. After a sad history filled with intolerance and suppression todays action is focused on integration, trying to provide them with the benefits of modern life like access to education and medical support. Still it feels so wrong to impose our way of living on a culture that has been in Australia thousands of years before us. Maybe they might have been better off if modern society would not have interfered. You could spend a lifetime to find an answer to this question and still not succeed. One night we met up with some friends and visited the staircase to the moon night markets on town beach. We had the pleasure to see Nathan Griggs whip cracking to music. He is among the fastest whip crackers in the world and trying to make a living from traveling around, cracking his whip, asking people for a little donation. We uploaded a second video of Nathan Griggs to our Youtube Channel showing him cracking his whip at world record speed. On our last day in Broome we had a lovely breakfast right at the beach. We parked our car facing with the backdoor towards the ocean. 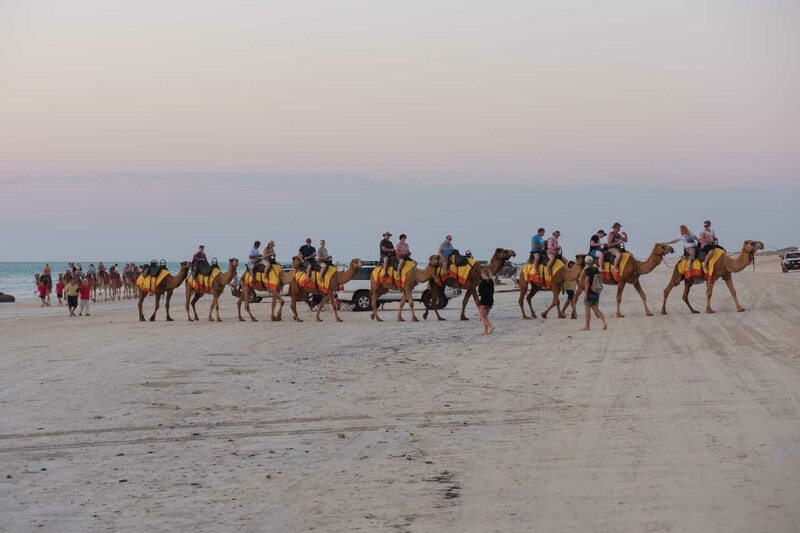 Seeing the camel tours walking by we still felt no desire to swap places and rather enjoyed the beautiful scenery at Cabel Beach from our perspective. After all we spent more than a week here, 4 lousy nights in the hostel, a few more camping wild and in the caravan park. For a few days the library became our second home, taking benefit of the free wifi to work on our website. Like mentioned before we were not able to recharge our laptops which gave a little restriction to our working hours but more time to discover the area. The main things that sticked to my mind about Broome was the quarrel between modern society and indigenous culture. Maybe inspired by the Bangarra Dance Theatre we put a little more effort into understanding the conflict and its aftermath. This somehow became the foundation of many fruitful conversations we had since then and I am really glad we are a little more enlightened on this topic.